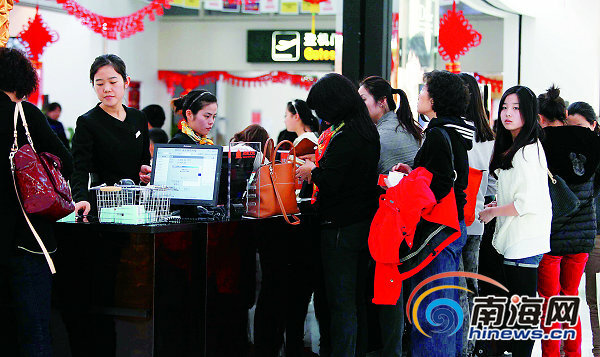 The Haikou Duty-free Store at Meilan International Airport saw sales of RMB15 million from 23rd to 29th January, 2012 with a recorded RMB3.04 million sales on 28th January. "We put more than 200 shop assistants to deal with the sales upsurge during the Golden Week, but we are still very busy,” the principal said. According to the figures released by the Haikou Duty-free Store, chocolates, perfumes and cosmetics are the favorites of tourists, among which perfumes and cosmetics account for about 50% of the total deals. Haikou Duty-free Store is the 1st state-owned offshore duty-free store, which opened on 21st December, 2011 at Meilan International Airport. The new store covers an area of two thousand square meters. It provides a wide selection of merchandise, from fragrances and cosmetics to sunglasses and watches. Different from the Sanya Duty-free Store, passengers can shop with their ID and boarding passes, and take their purchases with them right after shopping at Haikou Duty-free Store.